Even among St. Mary’s University School of Law students, where a commitment to public service and social justice is the norm, Eric Michael Garza’s dedication to service stands out. Garza, a student with the Class of 2016, has volunteered more than 370 hours since beginning law school in 2013 and has enabled the volunteerism of other law students by taking on the role of promotional organizer for the St. Mary’s Law Pro Bono Program. Garza helps orchestrate Texas RioGrande Legal Aid’s Community Justice Program’s family law clinics — promoting events through social media and wrangling other students to volunteer, via text message. “If you need anything done or need the word spread, he’s wonderful to work with,” said Gregory Zlotnick, a staff attorney at St. Mary’s Law and Pro Bono Program Supervisor. Garza said helping non-lawyers understand the legal process is at the heart of what inspired him to come to law school. “A lay person just gets so scared when he or she gets a legal notice,” said Garza, who sees pro bono work as one way to build the reputation of lawyers too. Beyond his pro bono efforts, Garza co-founded the Carlos Cadena Legal Dining Society, which began last spring with an inaugural dinner honoring Chief Judge Carl E. Stewart of the United States Court of Appeals for the Fifth Circuit. He has worked as a staff writer for The Scholar: St. Mary’s Law Review on Race and Social Justice, revived the Democratic Law Student Association ahead of the 2016 election year, and coordinated meetings with judicial candidates to promote civic engagement among law students. 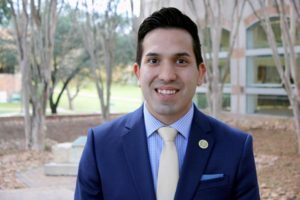 While pursuing his J.D., Garza has also earned an MBA at St. Mary’s University in December through a joint-degree program. His time at St. Mary’s has been made even more purposeful since he began college at the University but was not able to complete his undergraduate studies here. He ended up dropping his classes at St. Mary’s and later earning a degree in management at a different school.